Though Japan’s nuclear allergy is historically rooted (stemming not only from the 1945 bombings of Hiroshima and Nagasaki, but also from the 1954 Lucky Dragon Incident), contemporary remembrance is intricately intertwined with antiwar politics and opposition to Prime Minister Shinzo Abe’s security reform legislation. Opponents of the security bills are using the anniversary of the bombing to push their agenda by trying to remind the Japanese people of the horrors of war – and suggesting that war is inevitable should Abe’s proposed defense reforms pass. Standing at the site of so much suffering and calling for pacifism is an undoubtedly effective appeal to pathos. Hiroshima Mayor Kazumi Matsui’s criticism in his speech was more oblique. He argued that “broadly versatile security systems that do not depend on military might” and continued promotion of the “pacifism of the Japanese Constitution” are vital to abolishing nuclear weapons. Many hibakusha, atomic bomb survivors, are speaking up, demonstrating – yet again – that they are far from passive victims. Instead, they have been using their horrific and unique stories to actively push for world denuclearization. 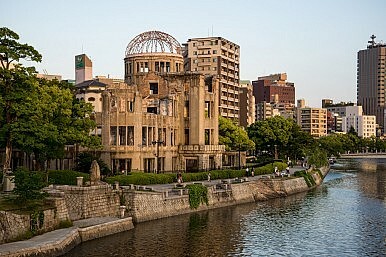 During the annual speech at Hiroshima, Abe did not comment on the security bills currently being debated in the Upper House, though he did repeat Japan’s pledge to “eliminate nuclear weapons from the world” and pledged a greater effort at the upcoming United Nations General Assembly toward this goal. Realizing how bad the optics were (especially since on Wednesday Defense Minister Gen Nakatani commented that the new security laws could theoretically allow Japan to transport nuclear weapons to its allies), Abe promised on Friday to include the pledge to observe the three nonnuclear principles – which are not enshrined in law – in his speech at Nagasaki on Sunday. Nagasaki has not become the bastion of peace activism that Hiroshima has, even though there is an annual commemoration ceremony there as well, at the Nagasaki Peace Park. One of the reasons is because of polarization in the community over the narrative about the suffering of the underprivileged, specifically minorities such as hidden Christians and burakumin. Furthermore, there is no immediately recognizable symbol such as Hiroshima’s Atomic Bomb Dome, which conveys the magnitude of suffering. There is a popular expression in Japan about the differing reactions between victims of the Hiroshima and Nagasaki atomic bombings: “Ikari no Hiroshima, Inori no Nagasaki” (“Hiroshima rages, Nagasaki prays”). On Thursday, we saw the rage against the futility of war, targeted against what opponents call Abe’s “war bills.” On Sunday, will we see prayers?